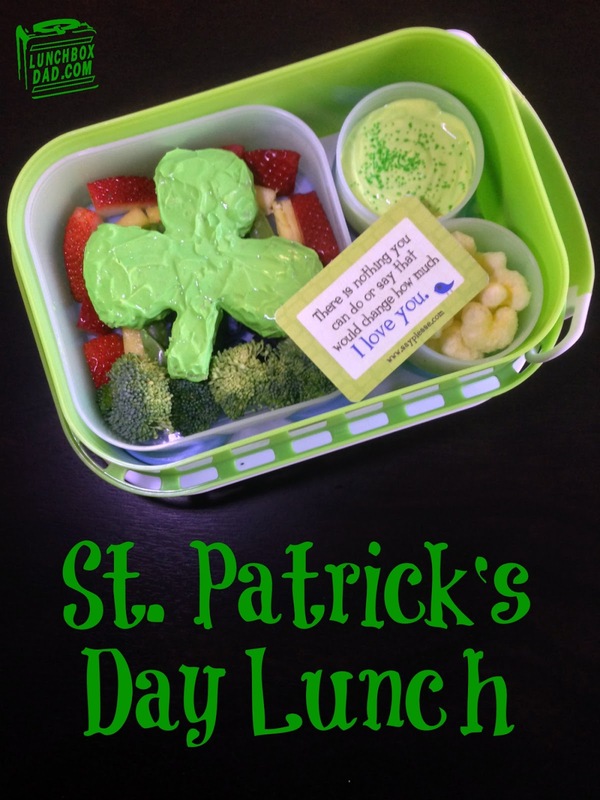 Year 2, Week 26: St. Patrick's Day Lunch. Believe it or not this is the first St. Patrick's Day lunch that I have done. That is kind of weird since it is such a fun holiday. My daughter will be celebrating it at school today so I wanted to make sure her lunch went along with the theme. It is pretty basic and still fun. This is an easy one to do, especially if you have a clover shaped cookie cutter. This lunch is made in a yubo lunch box and I also put in a Lunchbox Love note. 1. Slice whole wheat bread into the shape of a clover. If you have a cookie cutter just use that. I used sandwich rounds because it was very little waste for this shape. Spread jam between the two slices. Tint cream cheese green and spread over the top piece of bread. 2. 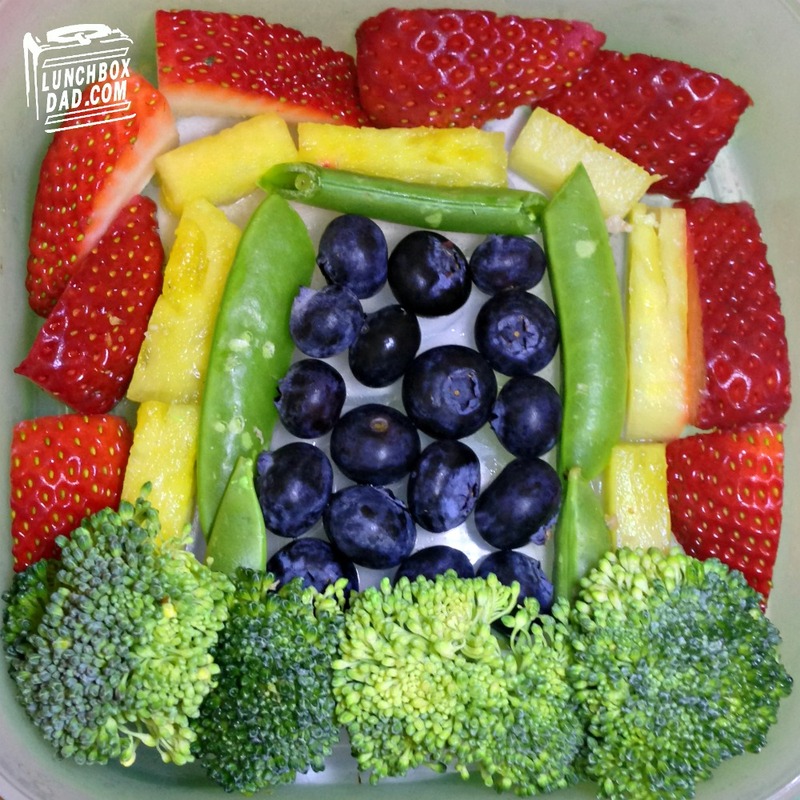 Arrange sliced fruit and veggies in the shape of a rainbow in your main container. The ones I used are listed under the ingredients. I used broccoli for grass as well. Place shamrock sandwich on top of fruit rainbow. 3. Place shallow layer of fruit in side dish. Tint yogurt green and spoon on top of fruit. Finish off with some green sprinkles if desired. 4. In second side dish use something that looks like Leprechaun treasure. I used Pirate's Booty snacks but you could also use popcorn or gold chocolate coins. 5. 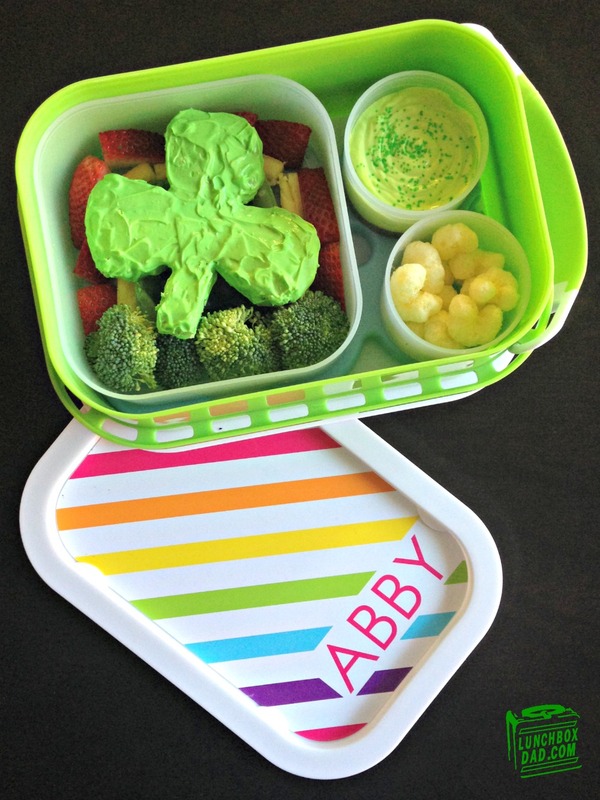 Place a green Lunchbox Love note on top if you have them. My daughter loves these! Happy St. Patrick's Day! I hope you have a chance to be silly and have some fun with your kids. Please check out my Twitter and Facebook accounts for so much more great stuff. You are seriously missing out if you don't! I love this lunch, so colourful and looks super tasty too! Thanks Grace and thanks for hosting the linkup!